Our birds come to us from all over the United States and all are non-releasable. Wings of Discovery provides lifelong sanctuary for these birds while educating the public about how best to protect these beautiful creatures and what we can do to keep them safe and in the wild. The name is another name for the color grey and she is a grey phase Eastern Screech Owl. Eastern screeches are roughly 6 inches tall and are one of the smaller species of owl found in the United States. She came to us from the Cypress Zoo and Rehab in Louisiana in December of 2013. She arrived at their facility at the same time as Felix and they have remained together, joining our older red phase "Siggy" upon arrival and currently residing with "Frankenberry." We are unsure of her age, since they were found in the wild, however we suspect they were in their first or second year when they came to us. Either she or Felix was seen flying into the side mirror of a car before being brought into the rehab center, however we are unsure as to which it was. While Sterling and Felix are a mated pair, Sterling (as with most female eastern screech owls) won't stick with the one male since none of her eggs have hatched. She refuses to acknowledge the possibility that she is the infertile bird. She had a serious injury to her right eye, rendering her blind, and ultimately resulting in the surgical removal of that eye. We believe her infertility could be the result of surgical complications. The name means "lucky" and Felix is also a grey phase Eastern Screech Owl. He was sent to us by the Cypress Zoo and Rehab in Louisiana in December of 2013. He arrived at their facility at the same time as Sterling and they have remained together, joining with our older red phase "Siggy" at arrival and currently residing with "Frankenberry." While Felix and Sterling are a mated pair, Felix has proven he prefers to be in a "group" environment and does best when there is a second male for him to buddy with. He also had a serious injury to his left eye, ultimately resulting in the surgical removal of it. We are unsure of the age, since they were originally from the wild, however we suspect they were in their first or second year when they came to us since they presented with suckling behavior during their post-surgical rehabilitation. The name is pronounced Ka-oo-ee and means "youthful beauty" in Hawaiian. She was found on the side of a freeway entrance in Santa Cruz, CA on July 7th, 2016. She has a broken talon on her right foot and a closed elbow fracture on her left wing. The elbow fracture is a complicated one, which makes her unable to fly well enough to survive in the wild. Wings of Discovery acquired her on August 1st, 2016 from Native Animal Rescue. Kaui appeared to be about 5-6 months old at that time. We based our age estimate on the fact that she still had a considerable amount of pin feathers emerging all over her along with small and thin beak and talons. Frankenberry is a red phase Eastern Screech Owl. He was named Frankenberry at the Owl Moon Raptor Center in Maryland, where they name their birds after the person who finds them. We like to refer to him as "Sir Frankenberry" here at Wings of Discovery, because he immediately took charge of the group when he was put with our other eastern screech owls and tends to stick his beak upward as though he is superior to everyone else :) Frankenberry came to us on June 10, 2017 after having been deemed non-releasable due to his vision problems. The Owl Moon Raptor Center brought him to a veterinary eye specialist where they determined Frankenberry to be blind in his left eye with some minor damage to his right eye. He can still see enough out of his right eye to get around and find his food in his enclosure, but not well enough to survive on his own in the wild. He will continue to need eye drops in his left eye as well for the rest of his life, or until such time it is determined surgery is needed to remove it. As eye surgery is such a risky and dangerous procedure for these little owls, it is not something we like to do unless it is medically necessary. Therefore, as long as Frankenberry does well with the eye drops, we at Wings of Discovery will continue giving them to him. We are happy to have added him to our collection, as are Sterling and Felix to have a new friend with them again. The name means "flying falcon" and she is an American Kestrel. American Kestrels are the smallest falcons in North America. She weighs approximately 90g full grown and was wild caught. She was born in Summer of 2008 and is on loan to us from our Founder/President and resident falconer, Stephanie Sayre and at 9 years of age is currently the oldest member of our Wings of Discovery program. Ziva is on loan to us from our Founder/President and resident falconer Stephanie Sayre. The name "Ziva" means "bright" or "radiant" and she is so named because of her bright and radiant coloring. 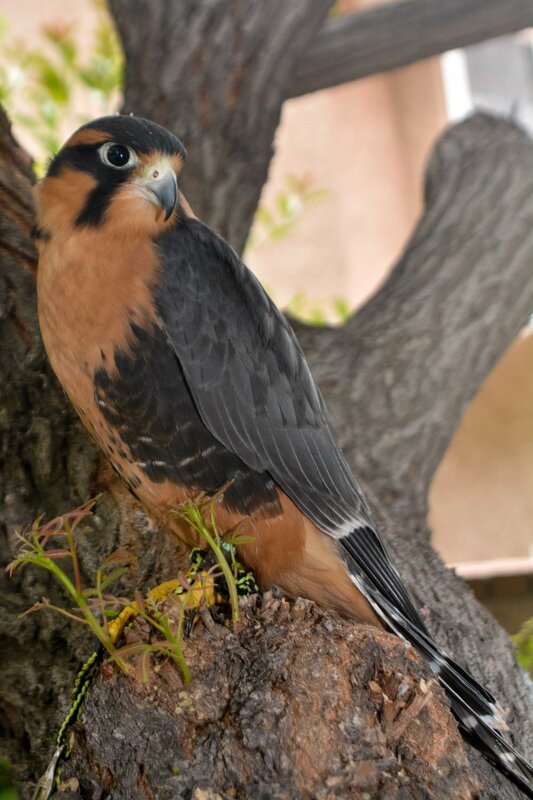 She is an Aplomado falcon, which are an endangered species of falcon. Ziva is a medium-sized falcon who was born March 26th, 2018 and is completely healthy with no injuries. Ziva is Stephanie's falconry bird who will be taught to hunt as well as spend time as an educational bird. She is a perfect ambassador to help spread our conservation message about how to save her species and other birds of prey that are endangered. Birds of prey typically reach their full adult size by 5-6 weeks of age and are flying by 8-10 weeks, just before their parents kick them out of their nest to fend for themselves. Stephanie acquired her on April 8th, when she was only 13 days old. Since her "bird dad" was not very good at being a father (he killed her sister), she had to be hand-raised at a very early age. However, that has made Stephanie and Ziva's bond very strong! She prefers to spend her time with Stephanie and can often be found on her head, playing with her tennis balls, or mini shoes, or just chillin' out on her back. Follow "Wings of Discovery" on our Instagram and Facebook pages to learn more about Ziva and see what she looked like as she grew up. You can also catch some cute shots/videos of how she likes to play and hear about any upcoming events and shows!